The life of a dog should be carefree and full of lots of playtime, unfortunately that is not the story for every pup. Rusty is a cuddly and playful young pup, but he almost missed his chance to share his awesome personality with others. 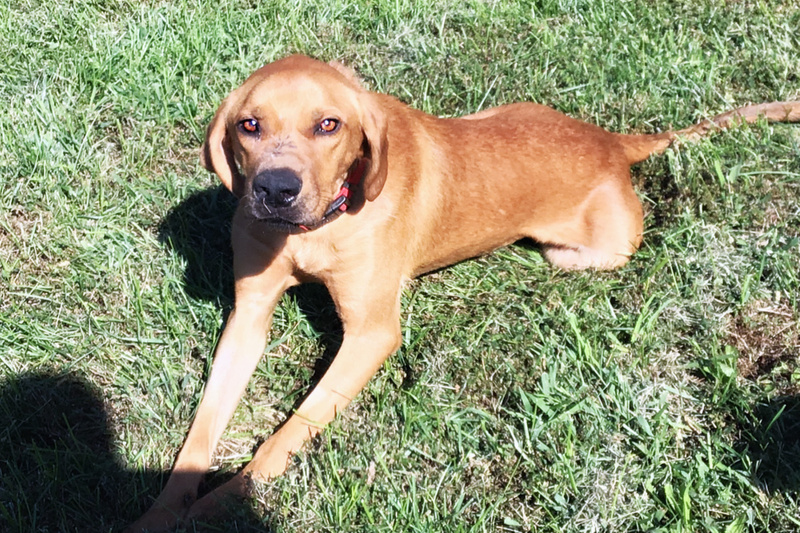 Rusty was found in Daviess County, Kentucky with a severe gunshot wound on his head. He had a large and infected hole on his face after being shot with a bird shot type of ammunition. Rusty had also become emaciated after consuming the bullet fragments, this led to a severe infection in his intestines, along with internal and external parasites. He was in rough shape and needed surgery as soon as possible. Though Rusty’s condition was extreme, the folks at The Arrow Fund were prepared to do everything they could to save him. The group pulled together their resources to pay for Rusty’s treatment. The Arrow Fund is a non-profit that fights to rehabilitate the animal victims of torture and abuse in Kentucky. They are also dedicated to bringing awareness of and eliminating animal cruelty. Rusty’s initial surgery helped clear his infections, but it soon became clear he would need additional surgeries to fully recover. It took five surgeries to repair the external damage on Rusty’s face. Unfortunately, the damage wasn’t only physical, Rusty was slow to make eye contact after being traumatized and suffering for so long, but those around him knew he had a tough spirit. He was placed with a foster family and they worked with him to repair the emotional damage that was done. When Rusty realized he was safe his true personality started to appear! Rusty has more medical treatments ahead of him, but The Arrow Fund helped turn his situation around. As inspiring as Rusty’s story is, the ongoing costs for cases like his put a big strain on organizations like The Arrow Fund. Luckily, our friends at Barefoot are also dedicated to helping pets in need. The Barefoot team partnered with The Arrow Fund to support Rusty and their cause. Together, Barefoot and The Arrow Fund hosted an event to raise additional funds for Rusty and 30 other dogs who’ve come to the group under similar circumstances. Rusty’s foster mom brought him to the event so he could show off his progress. Rusty was the star of the show and by the end of the night, more than $2,000 had been raised to help The Arrow Fund. Rusty’s story not only inspired donations, but his foster mom also announced she would adopt him as soon as he is medically cleared. We are so happy for Rusty and grateful that organizations like Barefoot and The Arrow Fund are working together to help animals in need. Cheers to finding Rusty a forever home!